Over the weekend I recovered some dining chairs at Rick & Jodi’s house. She had this adorable antique set, but the old fabric just wasn’t working, especially with the nautical inspiration we were drawing from. Remember this fabric that we picked out last week? It looks really good with the dark brown finish on the chairs. When you’re working with a stripe, obviously it’s important to keep the stripes straight, but for something this small, you don’t need to get all Rocket Scientist about it. Eyeballing it is my preferred method of dining room chair re-covering. 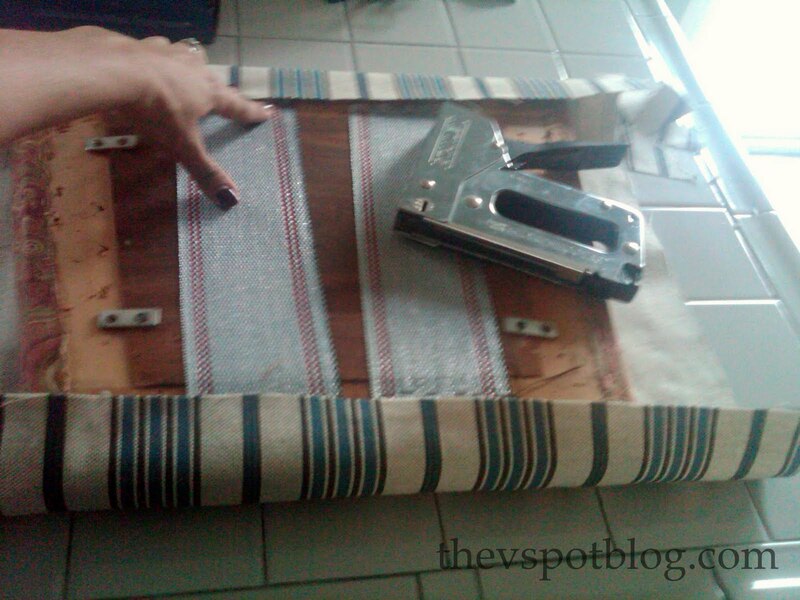 Start by making sure the fabric is straight and lay the seat down straight on top of it. Secure with one staple in the middle. 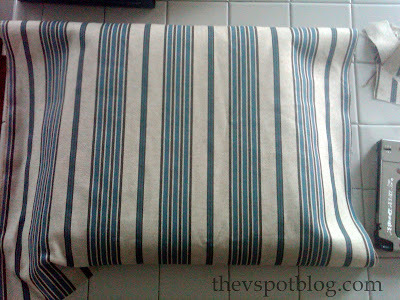 Next, fold over the fabric on the side opposite from where you’re working. You should be able to eyeball that the stripe you started with is “coming out the other side” in a way that it still lines up with your starting point. Holding the fabric securely, flip the cushion right side up and eyeball it one more time to make sure. In this case, I used the grout lines on the counter sort of as a guide to make sure the stripes are straight. 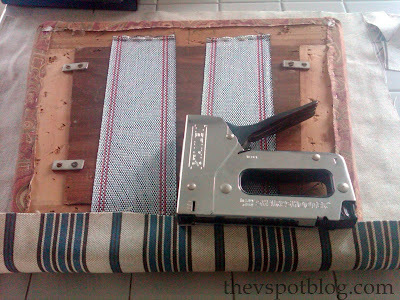 It looks straight to me, so staple the fabric into place and reattach it to the chair. Jodi picked out this fabric and I am loving it! So much better than the dated paisley. Wow looks like a totally different chair. Fabulous! Great update for sure. I don’t notice it being uneven in the pic! I love the “eyeball” method. It’s my preferred way of doing just about everything. NOW, that paint on the wall…that blue….ME LIKEY! Yep, I’m all about the “eye ball” technique. Works for me almost every time. 😉 Love the fabric! Looks great with the dark wood. 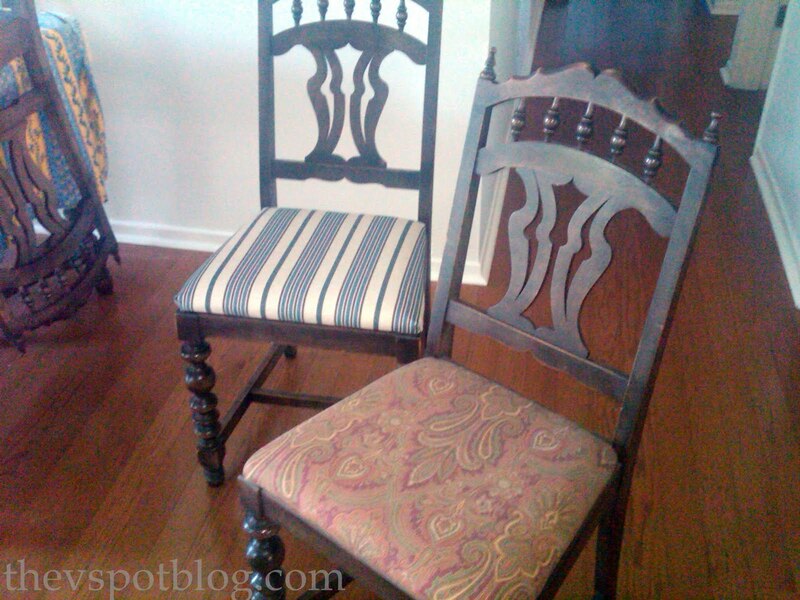 Pretty fabric pic – I love recovering seats!! They look fabulous! 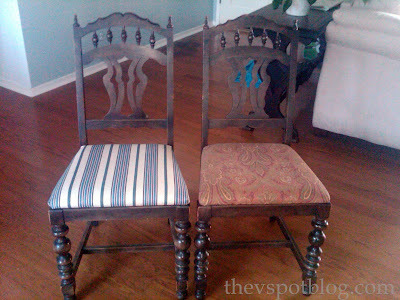 I have some bar stools I want to re-cover. But I’m super nervous, because the fabric I picked is striped, very similar to yours in pattern, but the seats are round! Yikes! I’m afraid I’ll make the lines wavy! The world’s easiest Glue-Gun table runner. A spookified dining room chandelier.